Editor’s note: this is the third of an occasional series, People to Know, profiling notable people working in Canada’s higher education community. Follow the hashtag #peopletoknow. Also, please note that on April 15, 2019, we updated Dr. Jhangiani’s title to reflect his new position: associate vice-provost, open education. Previously, his position was special advisor to the provost on open education. Dr. Jhangiani’s initial interest in making education accessible is far from academic. Growing up in Bombay (Mumbai), India, his wealthy family suffered financial and personal setbacks including his father’s death at an early age. The losses led to an uncertain future. At age 12, Dr. Jhangiani’s grandparents took him in and at 18, they supported his move to pursue higher education at Capilano College in Vancouver. It was there that he discovered a love of teaching and the beginnings of a career path. He went on to pursue his bachelor’s, master’s and doctorate degrees at the University of British Columbia. “The notion of the transformative potential of higher education is definitely not a theoretical concept [for me],” says Dr. Jhangiani. He notes that his passion for open education connects strongly to his personal narrative because he knows that the potential benefit is highest for marginalized students. “I really do believe that higher education is a vehicle for economic and social mobility,” he says. Rajiv Jhangiani is known for his advocacy of open education, but he also has one of the best avatars on academic Twitter. 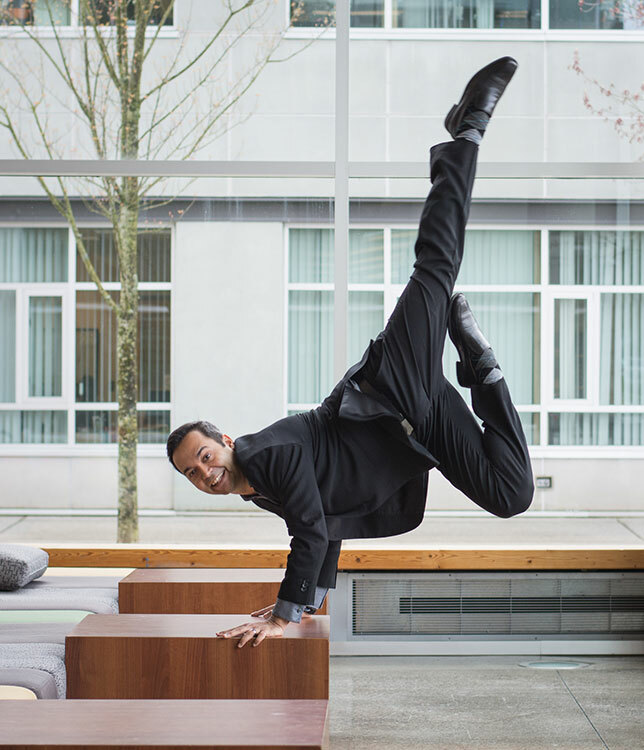 The photo, staged at Kwantlen Polytechnic University, pays homage to the researcher’s previous career as a dancer. Photo courtesy of Kwantlen Polytechnic University. His work at KPU involves everything from creating and adapting open textbooks and resources, to training faculty in open education principles and organizing inter-institutional partnerships. He’s also the force behind Zed Cred, KPU’s flagship open resources program that allows students to complete select credentials with zero required textbook costs, a first in Canada. In March, the university announced it would expand Zed Cred by adding a two-year Associate of Arts degree to the program’s certificate and diploma options. He estimates that Zed Cred has helped more than 16,000 students save over $1.60 million in textbook costs since its launch in 2017. According to Dr. Jhangiani, 2018 was a breakthrough year for open education. Whereas KPU was first to adopt open textbooks in 2012, today 90 percent of B.C. institutions use them. Growth is also accelerating across Canada. The movement has matured to the point where conversations are expanding beyond the initial focus on cost savings to how the open approach can benefit teaching practices by allowing professors to personalize textbooks for individual classes, or create assignments that challenge students to add to the course’s common resources. “Open education is definitely saving students money, but it’s also giving students authentic learning. Their level of motivation and interest is dramatically spiked. For faculty, it’s really reinvigorating their own approach to the classroom,” says Dr. Jhangiani, who has his students write op-eds and annotate his open textbooks with their own experiences and examples. Yet another sign of maturity is in the fact that practitioners are beginning to look critically at the movement, with Dr. Jhangiani helping to foster this discussion. To that end, he co-founded a website called the Open Pedagogy Notebook and in 2017, he edited a collection of papers titled Open: The Philosophy and Practices that are Revolutionizing Education and Science (available as an open text, of course). Dr. Jhangiani’s reputation continues to grow as well. His UN presentation sparked new partnerships between KPU and universities in Sri Lanka and Australia, among others. And Dr. Jhangiani says he’s looking forward to continuing to boost open education as it spreads even further.